A renowned English Catholic writer, Stratford Caldecott, is in the last stages of his battle with prostate cancer, which he was diagnosed with in late 2011. Caldecott, the GK Chesterton Research Fellow at St. Benet's Hall, Oxford, has served prolifically in the Catholic publication industry for decades, both as a writer and editor, serving on the editorial board of the International Theological Journal, Communio, as well as T&T Clark publications, the Catholic Truth Society, as co-editor for Magnificat UK, and also his own literary journal, Second Spring. He received an honorary doctorate in Theology from the JPii Institute in Washington, DC. I have met him and his family on occasion, and they are quite simply good, faithful Catholics. For this reason, while I was aware of his illness, I was rather amazed to hear of the latest turn of events as they unfolded. My father, Stratford Caldecott, was diagnosed with advanced prostate cancer in October 2011... Life since then has been very strange. He has bravely, patiently tried every treatment available to slow down the progress of the cancer, and we have been blessed with some good – almost normal – times together, amongst the bad. The doctors now say that dad is into the final stages of the disease, the part where your bones fracture under the slightest impact, and swelling around vital organs starts to happen for no apparent reason. They say that we only have around 12 weeks left. We have to make these 12 weeks count, and I have an idea about how we can do that. Sophie goes on to speak of her father's love for Marvel comics since boyhood, and more recently, the Marvel films. Apparently, they went to see the last Marvel film in the cinema, but he was too sick to be able to make it to see the latest Captain America film. We’re going to try and get in touch with Marvel to ask if they can fulfil dad’s dying wish by sending us a copy of the film for him to watch at home. But I think we can go further than that. 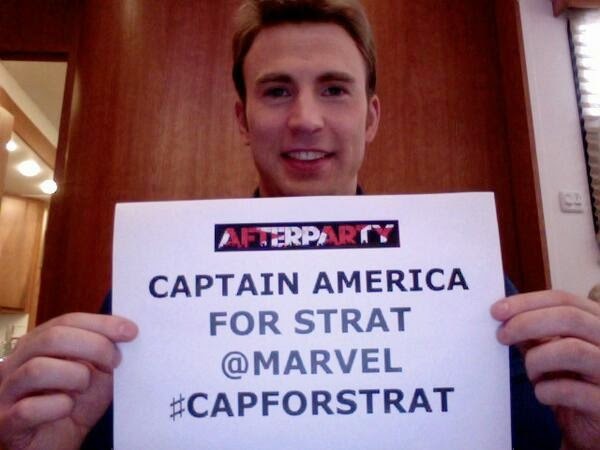 We’re also going to tweet the Avengers actors and see if they will take a picture of themselves holding a sign saying ‘Captain America/Thor/Iron Man [insert name of character here] for Strat!’ so that we can surprise him with their messages of support and encouragement. Since the doctors estimate Stratford has only 12 weeks to live, the Marvel Studio has confirmed that they will offer an advanced private screening of Captain America: The Winter Soldier in the Caldecott home next week. As Catholics, we are called to visit the sick and to comfort the afflicted, and, when the time comes, to bury and pray for the dead. I think it really heartening that Hollywood has responded in spades on this one, and, in your charity, I ask that you offer some prayers for Stratford that his suffering might be eased, and, when his time comes, that he has the grace of a good death, fortified by the Sacraments. 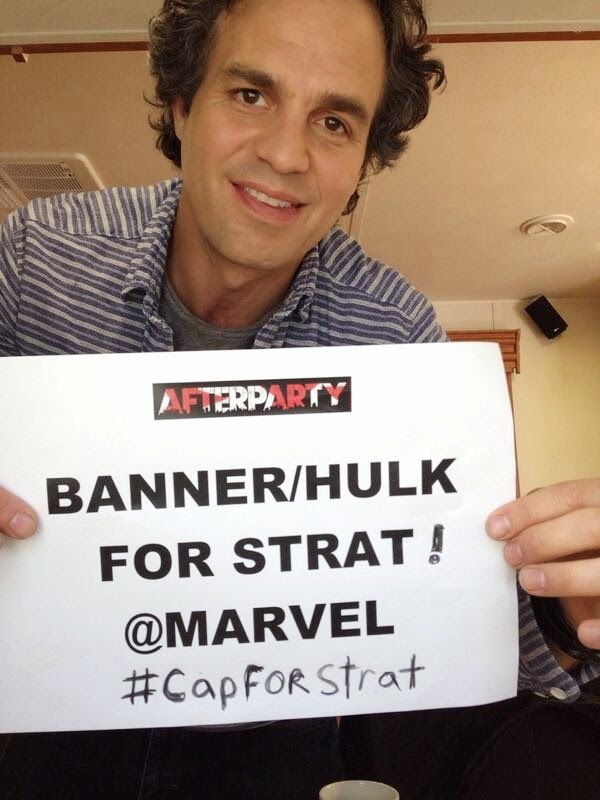 Sophie has compiled a page of pictures of all of your favorite Marvel Characters who have responded all in one place - it is really quite amazing how many have come out in support of one man's battle against cancer. So sorry to hear of this. Several years ago he and Léonie graciously took time out of their busy schedules to show my family and me around Oxford. Please encourage your blog readers to pray the devotion of the Holy Face for Mr. Caldecott and his intentions. It is a devotion that is too little known in these troubled times. Healing Mass , annointing, prayer......also try cancertutor.com, beating-cancer-gently.com and related links. Eh, I think is worldly. It sounds bucket list-ish. I don't think it gives God glory. Hmm. Marvel is currently doing a great job introducing gay characters and marriages in to their comics. I am not sure what to think about this in light of that. Can we also forget the background behind the Marvel Universes which seems not very "Catholic"? Why on earth would a dying grown person care that they get to see the new Captain America movie, a Catholic Theologian at that? It's all a bit worldly as the individual above me commented. Don't connect Marvel too directly with the actors themselves. They are several degrees removed from Marvel. I agree though that if I were dying this wouldn't be on my mind. yeah, this is heart-tickly and all that. but Mundabor, as much as I am uncomfortable with his pope-bashing, has a good point. This man is dying, and he is spending his last moments in time collecting trophies that a ten year old would find worthy (and would ditch them with shame four years hence). What about a holy death? What about getting these marvel heroes to perhaps think of their mortality? Mundabor's blog can be depressing, and not proper at times, but he makes you think. I hope this man can leave such things and turn toward his final destination. So you see my fellow commenters, in order to lift up the world we musnt be a a bubble of tradition floating and waiting for people to come, but we should take interest in what interest others, for it interests God too, for his interest is us (wherever were at). Be like St. Paul, take the good leave out the bad. Get the Christmas tree and date, leave out the pagan God. Like wise, find out about sports and pop culture, leave out the bad and pray. That way you will be able to reach and touch instead of wait and engage. Let the dying man have his wish. No one knows if God is behind this wish. How many already have been introduced to this man and his faith based on a simple request. Maybe not so simple...huh?